Look Fantastic on a Budget! Are you ready for fall? Well, here we go! With the newest plus size dresses cheap for fall 2018! Every dress here is under $30 at the time I am writing this post (August 18, 2018). First of all, take for example, this cute dress that would be appropriate for church or maybe a cocktail party. It comes in either black or navy, in sizes 14-16 to 22-24. So cute! And, here’s another frock that will look great in the office or at church. It comes in three color combinations, including the burgandy and black shown here. It is available in sizes small to 4X. Most importantly, you are going to love what the design of this dress does for your figure! Great Basic Dress at a Great Price! You gotta love a great basic dress that is available in extended sizes up 7X! This is a very comfortable and versatile dress, very basic and easy to accessorize. Daily Ritual is Amazon’s clothing brand, and I love the line for great basics! Check it out! Oh! I almost forgot to add, this dress is also available in grey, which is my favorite color! How could I forget that?! You all know how much I love Jessica London! Here’s a cute JL jacket dress that will take you from the office to a date night with a simple change of accessories. It comes in the ruby rose color you see here, or in black. It is basically a LBD with a versatile jacket. Available in sizes 12Plus to 18Plus. You will get so much mileage from this one! And, here’s another great Jessica London dress! It’s a more casual design and fabric (the dress is made of Tencel). Most importantly, you can change the look of this one a lot with your accessories. It comes in sizes 12 plus to 20 plus, and is offered on Amazon at a GREAT PRICE! 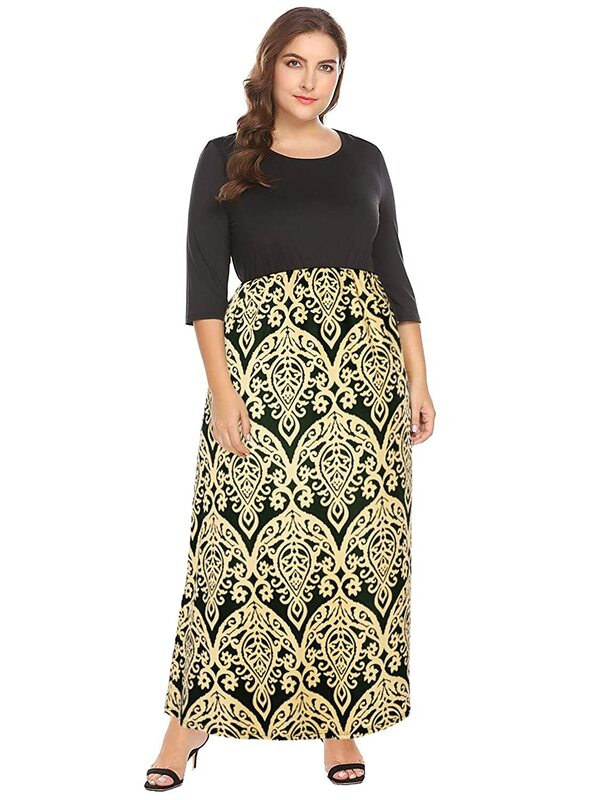 If you are looking for a cheap plus size maxi dress for fall, this could be the one! It comes in 3 different colors, and in sizes 14 plus to 24 plus. It’s perfect for all the casual parties and events coming up on your social calendar! Finally, this striking sweater dress will attract attention wherever you go! Plus, it will keep you cozy warm as cold weather moves in. It’s a win-win in our book! It is available in sizes 12W up to 32W. Such a warm and pretty dress, and at a great price too! Don’t pass this one up! 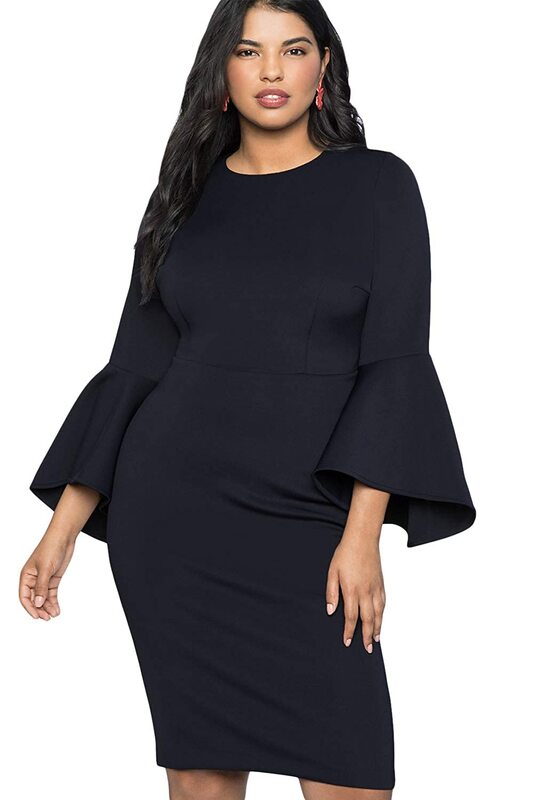 I hope you loved these cute plus size dresses cheap for fall 2018! 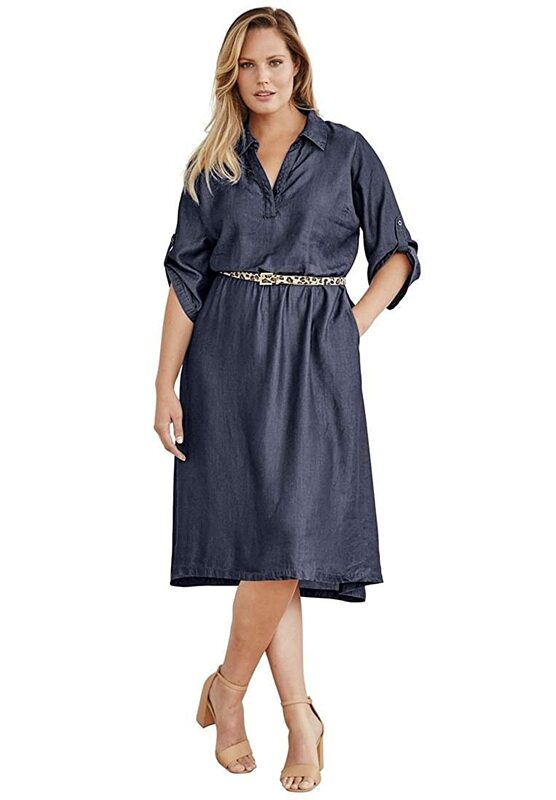 You might also like this cute denim maxi dress that costs a little more, but is great for fall! Be sure to check it out! Cotton House Dresses for Women -- Perfect for Summer!